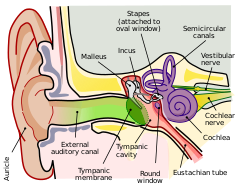 ↑ "tympanic membrane (anatomy) -- Britannica Online Encyclopedia". britannica.com. 2012. Retrieved 29 May 2012. This page was last changed on 30 December 2018, at 11:00.